Bitcoin fell as much as 70% from its mid-December high through its recent early-February low. 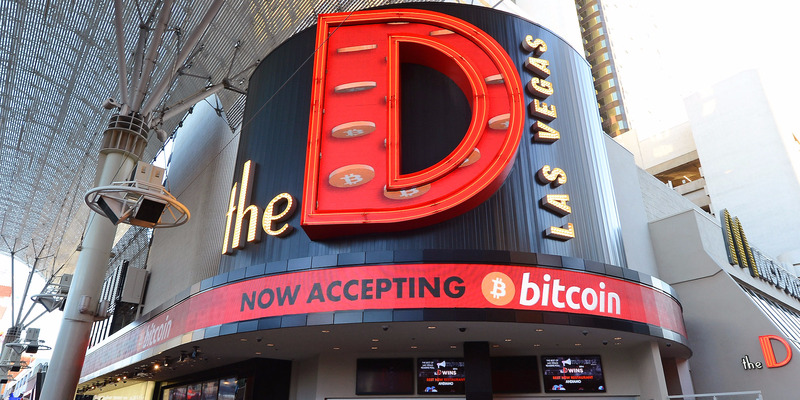 The cryptocurrency’s price chart mirrors that of the Nasdaq Composite Index during the dotcom bubble era, but there’s a catch. 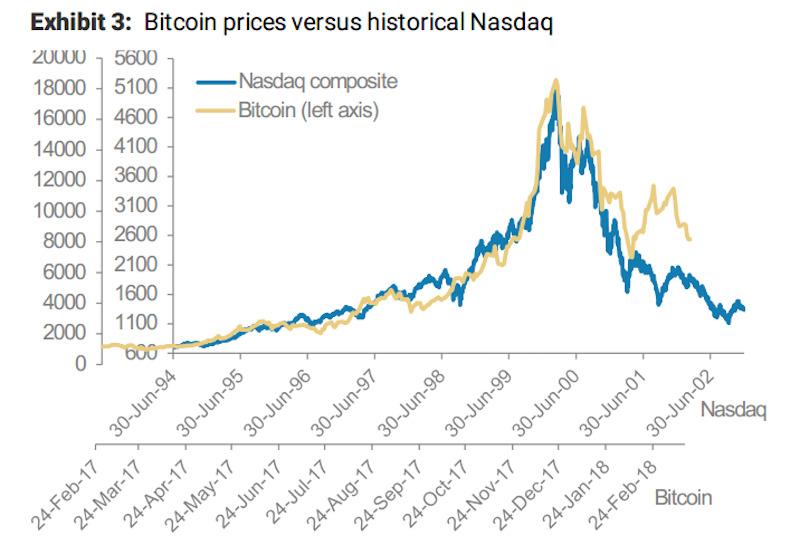 Historical fluctuations in the Nasdaq should provide a template for how bitcoin will trade going forward, especially considering their similar patterns. Recent declines in bitcoin may be foreign to traders accustomed to record-breaking returns, but the cryptocurrency’s price chart looks awfully familiar to strategists at Morgan Stanley. It reminds the firm of how the Nasdaq traded in 2000, during the tech bubble’s heyday. 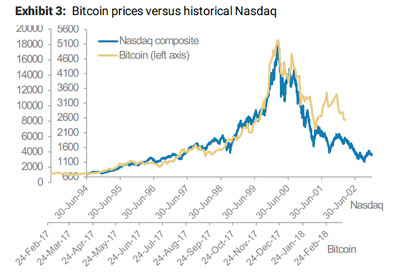 And based on the chart below – which overlays bitcoin’s one-year performance over a 15-year Nasdaq line – they have some serious similarities. The only catch is that bitcoin is moving 15 times faster than the Nasdaq did. 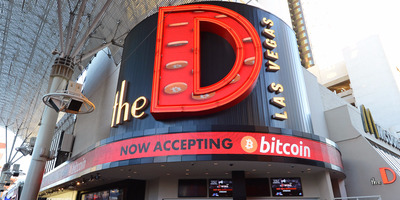 Morgan Stanley highlights bitcoin’s recent descent into a bear market, which has seen the cryptocurrency fall 70% from its mid-December peak to its most recent low in early February. The firm argues this is a totally normal turn of events for bitcoin, once again highlighting its similarities to the dotcom-bubble Nasdaq. Perhaps most intriguing to bitcoin enthusiasts will be Morgan Stanley’s finding that these types of weak spots have historically preceded rallies in the underlying asset. During recent selloffs, the price of bitcoin has fallen an average of 47%, then rallied an average of 43%. Back in the span from March 2000 through October 2002, the Nasdaq fell an average of 44%, only to rebound roughly 40%, Morgan Stanley data show. Those are some eerily similar fluctuations. So what’s the big deal? Is there any insight to be gleaned from this intertwined relationship, marked by investor overexuberance? Given the similarities seen, investors should be able to use the historical Nasdaq chart to forecast moves in bitcoin – so long as they apply Morgan Stanley’s 15-to-1 ratio. Comparing the two is also a worthwhile exercise in staying calm amid panic-inducing conditions. As the chart below shows, even the worst selloffs in the dotcom-era Nasdaq were softened somewhat by the roaring rallies that followed. Given where bitcoin is in its current cycle, bulls should find comfort in knowing a rebound may soon be afoot – that is, until the next inevitable reckoning.